I took a train to Liverpool. They were having a festival of litter when I arrived. Citizens had taken time off from their busy activities to add crisp packets, empty cigarette boxes, and carrier-bags to the otherwise bland and neglected landscape. They fluttered gaily in the bushes and brought color and texture to pavements and gutters. And to think that elsewhere we stick these objects in rubbish bags. While I know that Bryson is (quite successfully) being funny, after reading these words, I began to wonder if there was any way to actually find beauty in the refuse strewn about on the sidewalks and in the grass. Could a Festival of Trash actually exist? The short, honest answer is no. Because trash is ugly. I would be lying if I did not say that almost from our first moments here back in August, I was overwhelmed by how much trash is on the ground in Aberdeen. And we are not even going to discuss the issue of picking up after dogs or vomit piles, mainly because I need to keep pretending those things are not there. But I have started to pay closer attention to the bottles and cigarette packets instead of trying so hard to look away. I have been looking for the stories in the trash. Every day I pass a park on my way to and from Simon’s school, and there is a particular brand of vodka bottle that is repeatedly tossed there. 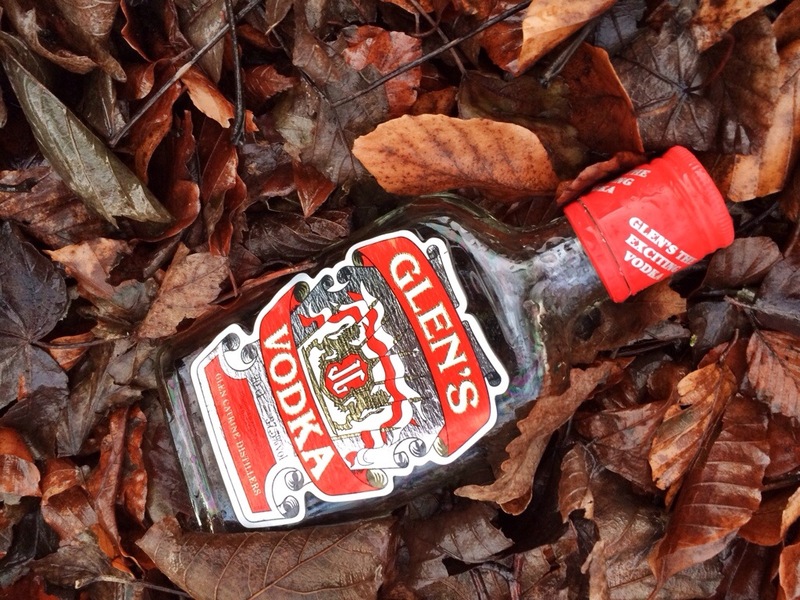 One day I counted five different bottles of Glen’s Vodka from the beginning to the end of the park. Over the last few weeks, I have been counting bottles and forming in my mind a picture of the drinker of these empties. 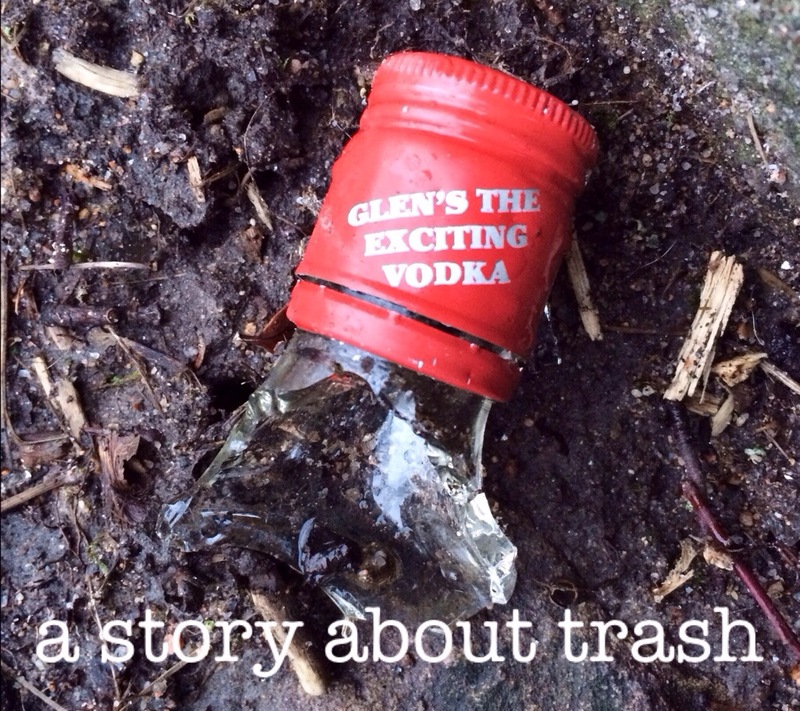 Now I find that I am always looking for one more empty bottle of Glen’s Vodka. In my mind, I see a man walking to this park every night from the convenience store and sitting on the rock wall drowning his sorrows in cheap booze. Or maybe he pulls up in his car and just chucks the bottle out the window in the grass. Every day I invent a new story about what the world looks like that he is trying to escape. He got in a fight with his wife. He can’t shake his bad memories. Every day, his heart is newly broken by some invention of my imagination. Some days I just see the red metal lid on the sidewalk, and I impart a bit of my own sorrow onto the ground. I wonder if the drinker’s burden is lightened by the leaving of this little bit of rubbish. Because I make up stories like that, too, I’m going to call your idea brilliant! Turning lemons into lemonade, or some such thing. I love a storyteller who tells herself stories!